There are certain physical changes we all know to expect during cancer treatment – like hair loss and dry skin. But many patients, including myself, are caught off-guard when we start having issues with our nails. It makes sense, of course. Chemotherapy targets and kills all the rapidly dividing cells in our bodies – including the ones that help our nails form and grow. The good news is that nails are resilient structures and can endure a tremendous amount of trauma. That’s way many people that have chemotherapy won’t lose their nails or won’t show any signs of stress but much of it depends on what type of chemotherapy protocol you have. Studies show that Docetaxel and paclitaxel have a 44% incidence rate for dramatic changes to the nail structure. Changes can include nail loss, discoloration, Beau’s lines (transverse grooves in the nail) and periungual lesions – just to name a few. 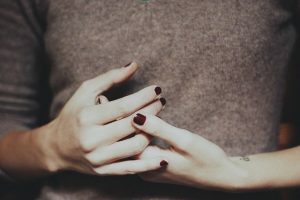 I had CMF chemotherapy – a relatively “light” protocol – yet my nails still got really weak and began peeling like crazy. What sets these side effects apart from those of the skin and hair is that they aren’t immediate. Since nails grow at a slow rate, under one millimeter per day, it takes almost two months for the nails that were formed during the days of chemo to grow out long enough to be seen! Because of this, there is nothing you can do to reverse the damage that was done to the nail’s matrix months ago. That said, there are things you can do to keep your nails as healthy – and pretty – as possible. Keep Your Tips Dry: Water is the harshest thing for our nails. I know this seems crazy, but water is the leading culprit behind weak, peeling, breaking nails. The solution is simple: Wear rubber gloves when doing wet work around the house and leather gloves when going out in the rain or snow. Break out the Biotin: This water-soluble B vitamin is the only supplement that has studies that back up with efficacy. Nail dermatologist (yes, that’s a real thing) recommend 2.5 milligrams a day. Make sure to take them! 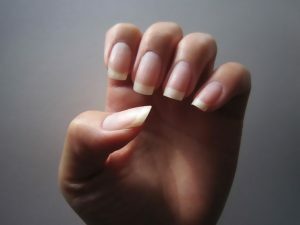 Get Growing: If Biotin doesn’t do the trick there are two FDA-approved prescription topical medications that can transform fragile nails. Genadur (a hydro-soluble lacquer) works by filling in the microscopic gaps within the nail surface to create a physical support to the nail bed. Nuvail (a polyurethane protective solution) creates a flexible sealant over the nail plate protecting it and helping to maintain moisture levels. Don’t Use Your Tips as Tools: Most of the damage our nails endure is self-inflicted. When we use our fingernails as tools – like as a screw driver or a scraper – we cause them to fray and tear. Being aware of this bad habit will help you correct it – and keep your nails healthier. Cuticle Oil is Key: Want strong, healthy nails? Cuticle oil – specifically those made from Vitamin E, almond, jojoba and olive oil are super hydrating and keep the nails pliable and prevent delaminating. Applying it on the cuticle twice a day will get the blood flowing and help stimulate cell regeneration and growth. I hope these tips help! If there is a nail treatment or tip that worked wonders for you during treatment I’d love to hear about it! Pretty Sick is out September 19th, but you can order your copy now! Just click below on the retailer of your choice!